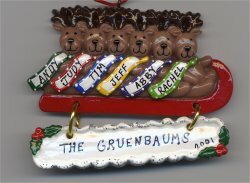 Season’s greetings to our family and friends from the Gruenbaum household. We can hardly believe another year has passed. We pray that this letter finds you healthy and in the spirit of Christmas. Judy has logged another year at Bank One. She has been there almost 9 years. Overall, it is going pretty well. She still travels a couple times a month – mostly to Chicago. At church, she traded in her choir robe for her bell choir gloves. She’s the one on the end with those really big bells. She has to admit that her hobbies have really gone by the wayside. She still scrapbooks with the help of her mom when she has a few minutes. It appears that God has given Andy an important message “Don’t work and stay home”. This message came in March when he was part of a 20% layoff at his employer. It has not been easy, but the boys and girls have both enjoyed having him at home. Although he might not be great at the laundry or cleaning, he does provide a pretty good routine for the kids and he’d be willing to take on almost anyone in the kitchen. In late July, he returned to the Czech Republic to help with a conversational English camp that was in a beautiful rural setting and sponsored by a Czech church. He has done some part-time consulting, but mostly, he’s been holding down the fort, which has really freed up Judy to work the hours she needs to. The boys continue to be an adventure. Timmy (7 ½ and 2nd grade) and Jeffy (6 ½ and 1st grade) are the best of buddies. They don’t like to be reminded of it, but they really are. Both boys have become pretty good piano players although you would not know this based on their enthusiasm for practicing. Their mother has recently taken over piano teacher duties. They enjoy their pets (fish…Is there a dog in our future? ), their friends at Worthington Christian Elementary School and at church, the memorizing of Bible passages, and the constant struggle between helping out and/or torturing of their sisters. Abby is a blossoming 2 ½ year old. Between hugs and snuggles she will yell, “Daddy is mean.” And cross her arms in front of her with a resolute look. And, of course, we are mean parents. 😉 She “mostly” loves her sister. She also loves candy, singing, playing (she really enjoys the Babushka dolls from daddy’s trips) and writing on anything (walls, windows, herself…). Rachel is now a year old. Although her nickname could well be “destructo”, she has a very sweet angelic disposition and spectacular smile. She brings great joy to our household. We took several trips this year. Early in the year, Andy, Judy and the boys flew to Florida for a quick visit to Universal Studios. In July, while Andy went to the Czech Republic, Judy and her mom made the long trek to Omaha to visit Judy’s sister. In August, we took a family vacation to Niagara Falls. As we view our house decorated in its Christmas splendor, we are grateful for each of the special blessings God has shown to us this year. May God also use this season to remind you of the special gifts that await you in the coming year and the eternity that is to come!